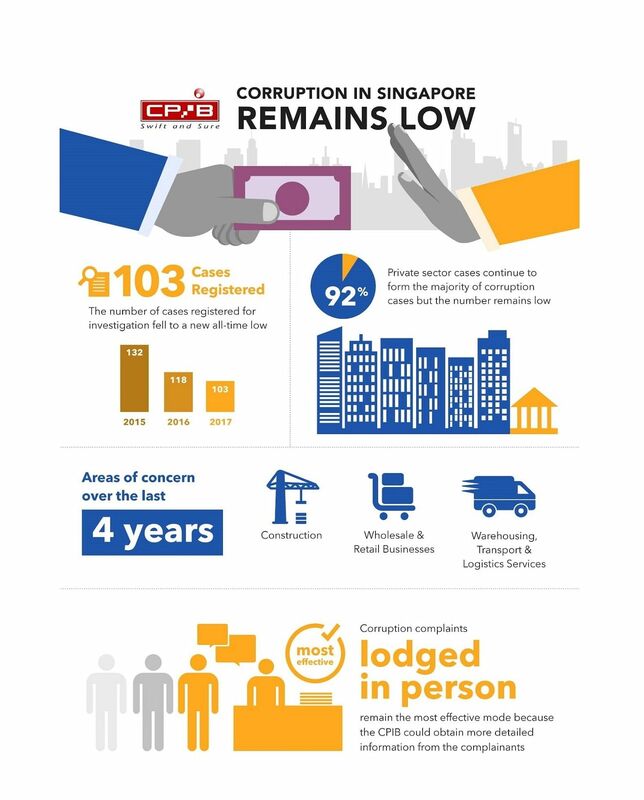 SINGAPORE - The number of corruption cases registered for investigation last year fell to 103, a record low, the Corrupt Practices Investigation Bureau (CPIB) said as it released its annual statistics on Wednesday (April 11). The cases were part of 778 complaints the bureau received. All complaints received by CPIB are evaluated by the Complaints Evaluation Committee, and a case is registered for investigation if the information received is deemed pursuable. CPIB said most of the non-pursuable complaints could not be followed up on due to insufficient, vague or unsubstantiated information provided. 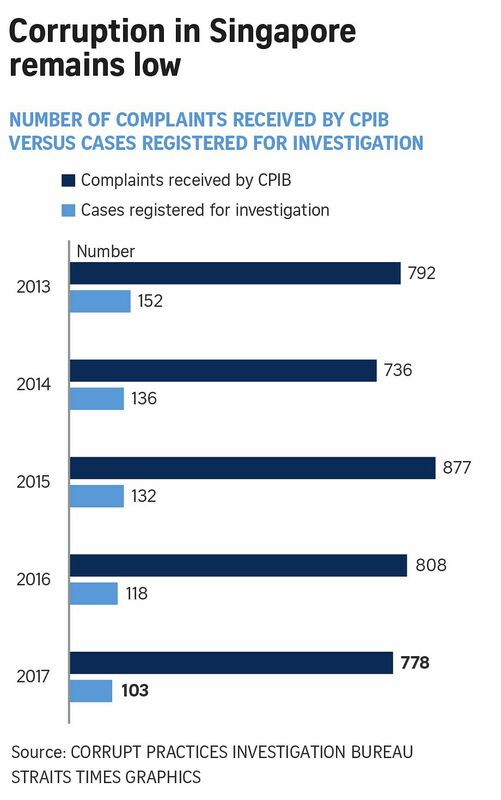 Over the past three years, a significant amount of the complaints lodged were found to be non-corruption complaints, with the CPIB referring them to the relevant government agencies for action. Last year, 410 or 53 per cent of the 778 complaints CPIB received were classified as non-corruption complaints. This was 45 per cent in 2016 and 46 per cent the year before that. In 2016, there were 808 complaints made, and 118 cases were registered for investigation. The lowest number of complaints made in the past five years was in 2014, when 736 complaints were filed. Private sector cases continued to form the majority of corruption cases, at 92 per cent. The areas of concern over the past four years are in construction, wholesale and retail businesses, as well as warehousing, transport and logistics services. These areas saw the highest number of private individuals prosecuted for corruption-related offences in the past four years. One of the cases that CPIB flagged was the high-profile overseas scandal involving Singapore-listed Keppel Corp's offshore marine unit. Keppel Offshore & Marine was investigated for making corrupt payments between 2001 and 2014 to officials of a Brazilian state-run oil company, Petroleo Brasileiro S.A. and other parties in order to win contracts with the company and/or its related companies. It was made to pay a total criminal fine amounting to US$422,216,980 (S$552,800,000) to the US, Brazil and Singapore under a Deferred Prosecution Agreement, led by the US Department of Justice. CPIB served the Keppel Offshore & Marine company a conditional warning in lieu of prosecution for corruption offences under the Prevention of Corruption Act. Of the private sector cases last year, 82 per cent involved individuals from private companies giving, offering or receiving bribes, while 8 per cent involved public sector employees soliciting or receiving bribes. 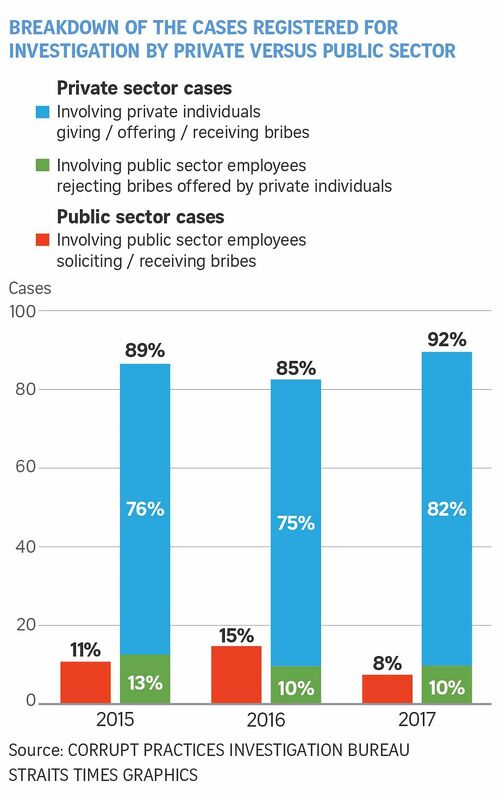 Public sector employees rejecting bribes offered by private individuals made up 10 per cent of the cases last year. Last year, 141 individuals were charged in court for offences investigated by CPIB. The number of private sector individuals prosecuted increased by 32 per cent to 132 from 100 in 2016. CPIB attributed this rise mainly due to cases involving multiple accused persons who were charged in court in 2017, and "not because of an increase in the number of cases". CPIB's statement comes after the Transparency International Corruption Perceptions Index 2017 ranked Singapore as the sixth least corrupt country in the world. Singapore also maintained its first-place ranking in the 2017 Political and Economic Risk Consultancy annual survey on corruption.